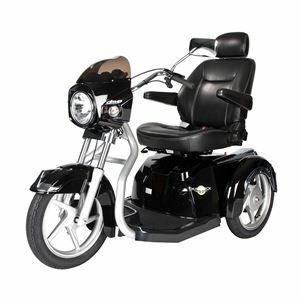 Maverick Executive 3-Wheel Scooter ** NOT AVAILABLE **,Maverick Executive Series Scooter in 3 wheels by Drive Medical - Style and Performance combined! Comfortable Sport Style 20” or 22” captain’s seat. Digital LED display with real-time feedback. Extra bright LED lighting package . Front Wheels 19.5" X 2.75"
Rear Wheels 19.5" X 2.75"
A very impressive,stylish and safe scooter. I love its instant speed control system. Its adjustable hand rest,reclining backrest and adjustable seat provides the maximum comfort. Maverick is a comfortable scooter with smooth and stable ride. I highly recommend this highest performance scooter.